The McGill Faculty of Medicine kicks off the fall 2009 edition of its popular “Films that Transform” series on Oct. 6 with a screening of One Week. 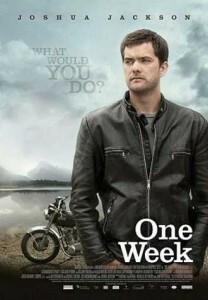 The 2008 film stars Joshua Jackson as Ben Tyler, a young man who has been diagnosed with cancer. With a grim chance of survival in the best-case scenario even if he immediately begins treatment, Ben instead decides to take a motorcycle trip from Toronto through the Canadian prairies to British Columbia. Along the way, he makes new friends, reevaluates his relationship with his fiancée, his job, and his dream of becoming a writer, and, after suffering some near-death experiences, learns to appreciate life. Designed to challenge viewers to explore how they can bolster their own wellness and balance, the film series serves as a forum for the public to explore the healing process with health care professionals. The screening of One Week will be followed by a discussion with Dr. Thomas Hutchinson, Director, Programs in Whole Person Care, McGill University, and invited guests, Dr. Bernard LaPointe, Eric Flanders Chair in Palliative Care, Director of Palliative Care, Department of Oncology, McGill University, and Dr. Janet Seely, Professor of Family Medicine, University of Ottawa, Founder of the Satir Learning Centre of Ottawa. One Week: Oct. 6; 7 p.m. Moyse Hall; 853 Sherbrooke West. Admission: $10, $5 for students and seniors. For reservations call 514-398-2298 or email: angelica.todireanu@mcgill.ca.